Yesterday I had the opportunity to tune a wicked little car, it’s sole purpose is to go fast, very fast on the track. The owner decided that he wanted to have enough power and grip to make sure that at any point on the track he would never be underwhelmed, under powered, or under tired. 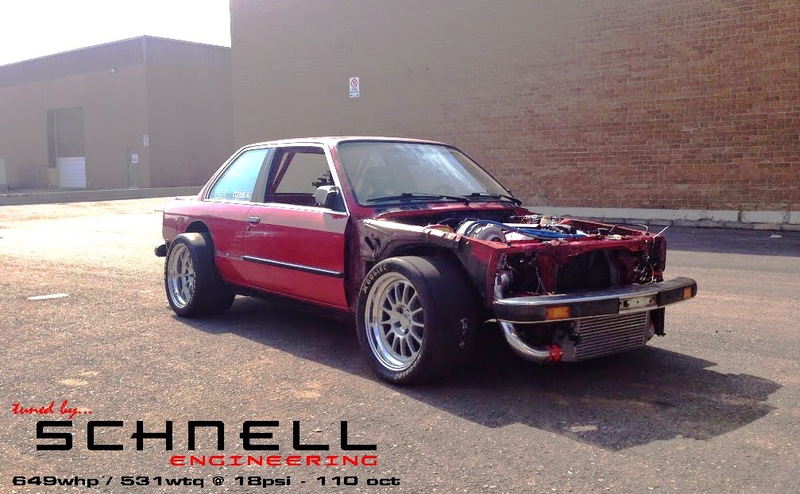 With considerable time off from the track, this E30 went from stock fenders and a naturally aspirated S52 to a monster fully built S52, with a GT4094R turbo, tubular header, full blown fuel system HP monster. While it is a work in progress, the owner wanted to know if his investment would be able to make enough power to give him the push to finish the fenders on this beast. The car did far more than exceed both his and my expectations on the dyno, effortlessly pulling an incredible 649whp at a lowly 18psi of boost, which is his base wastegate pressure without breaking a sweat (me on the other hand was trying to combat the heat and humidity in the car with lots of water). The plan now is to finish the car, and take care of a few small issues since the build has started and then bringing it back on the rollers to turn up the wick. This car should easily see over 800whp to quickly shrink the straightaways on the track!